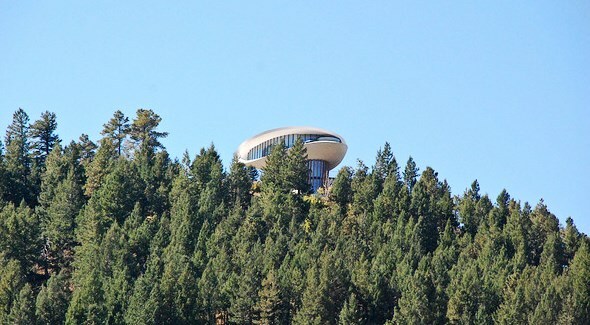 The spaceship-like “Sleeper” house on Genesee Mountain isn’t exactly the pride of Coloradans, but anybody who’s ever driven west into the mountains from Denver on Interstate 70 will remember seeing it. Named one of “America’s Ugliest Mansions” by Forbes Magazine, it’s also famed for its 1973 appearance in Woody Allen’s film “Sleeper,” as the location of the Orgasmatron (you’ll have to see the movie). The house, officially called the Sculptured House but also known locally as the Flying Saucer, is not open to the public. It was designed by architect Charles Deaton, who completed its $100,000 exterior in 1966 but not the interior. It sat empty for several years before being purchased in 1999, then completed, renovated and expanded. It has had several owners since then. The house covers 7,700 square feet on five levels with five bedrooms, five baths, a state-of-the-art kitchen and a top-level master suite. It sits on 15 acres high on the side of Genesee Mountain. The house has been featured on MTV’s “Extreme Cribs” and HGTV’s “Home Strange Home.” It also is listed on the National Register of Historic Places. The house is visible between exits 254 and 256. Look up on the mountainside on the south side of I-70. It’s just two miles east of the Buffalo Herd Nature Preserve on I-70.